Secretaries Kerry and Moniz testify. Photo courtesy of AP. With only seven weeks left until the September 17th deadline for Congress to vote to approve or reject the Iran deal, it is increasingly looking like a deal will rest on the support of a handful of key Democrats. Last week, in a contentious hearing at the Senate Foreign Relations Committee that stretched into a fifth hour, senior Obama administration officials mounted a spirited defense of the Iran deal in the face of near-unanimous Republican opposition. Secretary of State John Kerry, Energy Secretary Ernest Moniz, and Treasury Secretary Jack Lew all testified in their first public appearance before Congress since the announcement of the Joint Comprehensive Plan of Action (JCPOA). Committee chairman Sen. Bob Corker (R-TN) set the tone for Republican attacks by accusing Sec. Kerry of being “fleeced” by the Iranians. He was later followed by his colleague Sen. James Risch (R-ID) who declared “you guys have been bamboozled.” Sen. Marco Rubio (R-FL), a Republican Presidential candidate, charged that the agreement was “fundamentally flawed” and left the hearing shortly thereafter. Other Republican members of the committee were equally, if not more combative, with the exception of Senators Jeff Flake (R-AZ) and Johnny Isakson (R-GA). While Sen. Isakson was not as aggressive as his Republican colleagues, only inquiring as to why American nationals are not allowed to be part of the IAEA inspection teams, his previous statements have caused some to put him in the “No” camp. With Republicans largely united in opposition, the administration is forced to pin its hopes on convincing Congressional Democrats to block a possible vote of disapproval during the 60 day review period. Sen. Ben Cardin (D-MD), the ranking member of the committee and one of the key swing votes in the Senate, claimed “our negotiators got an awful lot, particularly on the nuclear front,” adding that many areas “have been strengthened since the April framework,” though he was noncommittal on how he would ultimately vote. In the coming weeks, the Obama administration will continue to defend the Iran deal during the Congressional review period while shoring up support among Democrats and any fence-sitting Republicans to stave off Congressional rejection. Sec. Kerry and Sec. Moniz will head to the House Foreign Relations Committee today in what is expected to be a similarly contentious hearing. Washington, DC – Congress must “come to grips” with the reality that failing to seal an Iran nuclear deal would mean war, according to the top Democrat on the House Foreign Affairs Committee. As Secretary of State John Kerry announced that negotiations with Iran would continue past today’s deadline, Representative Eliot Engel (D-NY) put the prospect of diplomatic failure into stark context at a hearing in the House of Representatives. “The alternative to a deal would surely mean some kind of military strikes on Iran’s nuclear plant,” said Engel, who has given the Obama administration room to negotiate but has also been skeptical of the negotiations and a strong supporter of Israel. His comments suggested that, despite some misgivings about the negotiations, some of the more hawkish Members of Congress acknowledge the imperative of reaching a deal as a matter of war and peace. Some in Congress have bristled at the notion that opposing a deal is the equivalent of pushing for war, but critics of the talks have largely avoided discussing what alternatives would look like if not military action. The public debate has thus regularly focused on areas of perceived weakness in the envisioned agreement, raising concerns that Congress may avoid debating the far greater costs of the alternatives. “If we are able to sustain the sanctions regime and have a bombing of their plant that sets them back two years or three years, is that really a viable alternative?” Engel asked panelists at the hearing. The willingness of the committee’s ranking Democrat to discuss the negotiations in such stark terms contrasted with the overall tone of the hearing which, like past hearings in the House and Senate on the Iran talks, featured witnesses that were almost exclusively opposed to a deal. Congress will now have 60 days to review a deal if an agreement is secured, and to decide whether to approve it or reject it. A rejection would almost certainly nullify the deal–freeing Iran from nuclear constraints under the agreement and likely unraveling international enforcement of the U.S.-led sanctions regime. WASHINGTON, DC — In a recent piece for Politico, Chris Schroeder describes an exciting new generation of Iranian entrepreneurs who are ambitious, highly educated and already “see the world outside of Iran every day—often in the form of global news, TV shows, movies, music, blogs, and startups.” As the Iranian economy prepares to open up to the world as part of an anticipated nuclear agreement, US companies could profit tremendously from engaging with this staggering trove of human capital. Absent U.S. commercial competition, the report claims, European, Asian, and Middle-Eastern businesses, “less deterred by the prospect of violating sanctions,” will be poised to fill that void. The report also emphasizes the need to keep “the incentives for Iran’s continued adherence in place” by intensifying the economic benefit Iran receives through compliance. Even without nuclear sanctions, the report explains, international businesses may avoid engagement with Iran to avoid unknowingly falling into the tangled nets of the U.S. sanctions regime. American and European officials should mitigate this confusion by offering “an unprecedented level of specific detail on the degree of continuing exposure to U.S. sanctions for non-U.S. banks and companies,” thereby minimizing confusion and maximizing clarity. To address the “substantial new requirements associated with the removal of sanctions,” the report also recommends that the US Congress give both the State and Treasury Departments the resources they need to “create a robust group of officials” dedicated to “engaging the public and the private sector about the changes in Iran sanctions.” This work would also include enforcing remaining sanctions imposed on Iran and issuing license authorization for parties to trade with Iran when it fell within the U.S.’s foreign policy interest. As negotiations with Iran have continued, one issue that has been raised is the concern of an Iranian “sneak out” to a bomb. Skeptics of the diplomatic process have even claimed that, under a nuclear agreement that increases inspections and verification mechanisms over Iran’s nuclear program, Iran could still maintain undeclared nuclear facilities that would give it a secret pathway to weaponization. However, far from making the case against a nuclear deal, these concerns strengthen the case for diplomacy because the best way to protect against “sneak out” is through stringent inspections and monitoring mechanisms–which can only be achieved through a diplomatic agreement. There are several measures that can be taken to drastically decrease the possibility of an undeclared Iranian nuclear site and its breakout potential. Already, under the current Joint Plan of Action (JPOA), measures have been taken to monitor Iran’s uranium procurement and prevent it from being used for covert activities. An important part of the Additional Protocol which was included in the JPOA is the ability of IAEA inspectors to visit Iran’s uranium mines and milling facilities. This is crucial because it allows inspectors access to Iran’s uranium holdings, allowing them to judge whether or not Iran’s program is exclusively peaceful or whether some amount of their uranium has been diverted to a covert facility. This is just one of the many types of inspections that Iran has agreed to under the JPOA, and can be increased under a final deal. To start with, any final deal will require that Iran implement and ratify the IAEA Additional Protocol. The Additional Protocol will allow IAEA inspectors to investigate all aspects of Iran’s nuclear fuel cycle–from uranium mines, fabrication of fuel rods, enrichment sites, and waste dumps–and to access all declared nuclear sites without prior notification. Measures like these will not just enable the IAEA to ensure that declared nuclear sites are limited to exclusively peaceful purposes, but to detect attempts to divert any materials if there is an undeclared site. Beyond the Additional Protocol, the P5+1 will likely push for further inspection measures to protect against undeclared nuclear activities. The IAEA could monitor the importation of nuclear related goods, and then compare this with the amount being used by the Iranian program to ensure that there are no discrepancies between what is being imported and what is being used at declared facilities. Measures such as these will drastically reduce the risk that Iran will pursue covert nuclear research through making such actions very difficult to achieve without detection by the international community. Based on previous Iranian actions, the concern about protecting against undeclared nuclear facilities is not unreasonable. But these concerns demonstrate why a deal that is strong on inspections and monitoring mechanisms is so important. 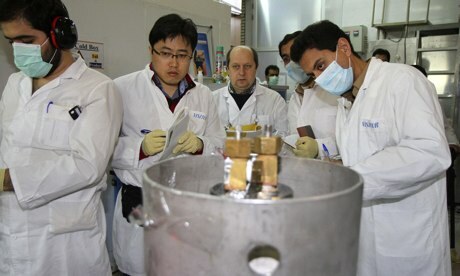 The alternative to a deal is less inspections, less verification, and less eyes and ears to detect and deter against “sneak out.” If negotiations break down, even the increased access granted to inspectors under the interim JPOA will disappear, leaving the IAEA with few options to verify that Iran no longer has covert sites and increasing the danger of military action. The bottom line: unless you want to put boots on the ground, you should support negotiations to put more inspectors on the ground. This weekend, the P5+1 and Iran announced an agreement to extend the deadline for a comprehensive nuclear agreement beyond July 20 to November 24, 2014. The new deadline, which falls on the one year anniversary of the P5+1 and Iran agreeing to the Joint Plan of Action in Geneva, provides four more months for negotiators to bridge remaining gaps at the negotiating table. Thus far, support for an extension has been strong among members of Congress, non-governmental organizations and editorial boards. Below, you can find a compilation of both positive and negative reactions to the extension. A wide majority of Americans favor a nuclear deal with Iran that limits Iran’s nuclear enrichment in return for phased sanctions relief, according to a new poll conducted by the Program for Public Consultation and the Center for International & Security Studies at the University of Maryland. Following extensive briefing on the arguments for and against a nuclear deal with Iran, 61% of those polled – including 62% of Republicans and 65% of Democrats – signaled “support [for] a U.S. decision to reach a long-term [nuclear] deal” with Iran.” Such a deal would include limits to Iran’s uranium enrichment; an intrusive inspections regime of Iran’s nuclear program; and the gradual easement of U.S. sanctions on Iran. The United States and Iran are in the midst of marathon talks to reach such a nuclear deal right now. Far fewer Americans – 35% — favored the imposition of “additional sanctions” at this time and an end to negotiations that would permit limited enrichment in Iran. This position is endorsed by hawks in Congress, who have long favored to cut off the present negotiations and impose new sanctions on Iran. The White House has so far been successful in blocking the push for new sanctions. Beyond the nuclear issue, the poll also highlighted how Americans favor greater outreach and increased ties to Iran. Asked whether they would support the “U.S. government engag[ing] in direct talks with Iran on issues of mutual concern,” 82% of those polled favored such engagement. Moreover, 61% of Americans favored increased cooperation with Iran in Iraq, especially to fight back against the gains of the Islamic extremist group, Islamic State of Iraq and al-Shams. According to the poll, Americans also support increased trade and cultural ties with Iran. Despite a two-decade-old trade embargo with Iran, 55% of Americans favored “greater trade” between the two countries, and 71% of Americans supported “greater cultural, educational, and sporting exchanges” with Iran. Increasing trade and expanding cultural and educational ties have long been contemplated as a means to bridge the divide that has separated the US and Iran these past three-plus decades. The poll comes at a timely moment in US-Iran relations. As the July 20 deadline for P5+1 and Iran talks rapidly approaches, the White House will need to sell any prospect nuclear deal to a skeptical Congress. Based on this polling data, that sell might be a lot easier than imagined. The Israel Project has recently launched a website which aims to convince the public that if Iran is allowed to enrich uranium at all, then Iran will certainly develop a nuclear weapon. However, holding on to such notions is a fallacy that will undermine diplomatic progress. While it would be great to have zero risk of Iranian proliferation, which the zero enrichment proposal seeks to attain, such a situation is neither attainable nor necessary to prevent a nuclear-armed Iran. Further, with sufficient safeguards in place, risks of Iranian weaponization can be diminished to reasonable and acceptable levels. Therefore, it is in America’s interest to sacrifice the long-gone idea of “zero enrichment” and instead focus on securing concrete and verifiable transparency from the Iranian regime. Insisting on unprecedented monitoring of the Iranian nuclear program, rather than deal-killing stipulations such as “zero enrichment,” will ultimately prove more effective in guarding against an Iranian nuclear weapon. The expectation and the feasibility of a zero-enrichment clause in any final deal with Iran is not realistic. As George Perkovich said, “Iran has already paid tens of billions of dollars in direct costs; lost more than $100 billion in sanctions; and suffered a cyberattack, the assassination of key scientists and engineers, and the perpetual threat of war to protect its self-proclaimed right to enrich uranium. There is no reason to think that more sanctions or military strikes would change Tehran’s stance now.” Further, an insistence on zero enrichment has precluded the possibility of viable nuclear deals in the past, including in a potential 2005 bargain with European powers that would have capped Iran’s enrichment at 3,000 centrifuges. Moreover, Iranians frequently bring up the argument that they want to have the capability to enrich their own nuclear fuel because they don’t want to be dependent on other nations whom they don’t trust. For example, Iranians mention the event in which France reneged on a deal with Iran after Iran had already provided a billion-dollar investment in the multinational enrichment consortium, Eurodif. France refused to deliver the nuclear fuel previously promised to Iran, thus giving the Iranians ammunition to strengthen their own nuclear program. Additionally, Iran is currently one of fourteen countries that enrich uranium on their own soil, including non-nuclear weapon states like Argentina, Brazil, Germany, Japan and the Netherlands. Under the NPT, parties are recognized as having the “inalienable right…to develop research, production, and use of nuclear energy for peaceful purposes without discrimination and in conformity with Articles I and II of this Treaty.” Any enrichment capabilities – which are neither granted nor denied by the NPT – are subject to full and thorough inspections by the International Atomic Energy Agency (IAEA). And under the NPT and IAEA inspection, no country has ever obtained a nuclear weapon. This is why it is a more valuable use of our time to expand the access of international inspectors than insisting on “zero enrichment”. Since a final agreement with Iran would likely include the ratification and implementation of the IAEA’s Additional Protocol and potentially further voluntary measures, insisting on zero enrichment while the Iranians hold firm in their opposition against the demand is a waste of time, diplomatic energy, and political capital. We should be focusing our energies into creating practical demands which we can get the Iranians to agree to in order to ensure Iranians cannot develop a nuclear weapon. And this is a fact that America’s highest ranked diplomats and politicians have already recognized. Regardless of whether you support the Geneva agreement or not, we will not obtain zero Iranian enrichment. Military strikes can’t bomb away nuclear know-how and would only enhance desires for a nuclear deterrent. Sanctions have failed to alter Iran’s nuclear calculus. Diplomacy, however, can provide sufficient assurances so that Iranian enrichment is used for peaceful purposes, and that’s where the US and the rest of the P5+1 need to focus their efforts. Her speech came at a critical time. On Sunday, the P5+1 and Iran announced an agreement to implement the first phase nuclear deal struck in November. Further, a number of Senators are voicing their strong opposition to the new Iran sanctions, including Sen. Tim Kaine (D-VA), the Chair of the Senate Foreign Relations Subcommittee on the Middle East, and Sen. Bill Nelson (D-FL). Despite the growing opposition, the bill still retains the support of a majority of U.S. Senators. Feinstein highlighted the strong security benefits of the first phase nuclear deal, including that it will require Iran to cap its enrichment at 5% and eliminate its stockpile of uranium enriched to 20%, all while instituting “the most intrusive international inspection regime ever” to verify compliance. “Above all,” Feinstein added, “they will argue that the United States is not interested in nuclear diplomacy–we are interested in regime change. “ Nuclear negotiations would collapse, Iran’s nuclear program would be unconstrained, and the U.S. would only be left with military options. Sen. Feinstein’s strong speech could weaken support for the sanctions bill at a critical time, encouraging other Senators to make their opposition to the bill public. Currently, two dozen Senators have yet to take a formal public position on the bill.